Got a tangled mess in your backyard and not sure what you want to do with it? Perhaps you want something exotic on the patio or in the home. Then consider growing an exotic jungle garden. With a little creativity and a few jungle-like plants, you can easily transform a messy landscape or empty niche into a tropical paradise. Best of all, you don’t need to live in the tropics in order to enjoy these exotic environments. You don’t need to be an expert in growing tropical plants either. All you need to create a lush, tropical oasis is rich, well-drained soil, a sunny location, and a few basic guidelines. Becoming familiar with the basic guidelines for growing these tropical-like plants is the first step when creating an exotic jungle garden. Important factors to take into consideration are good soil preparation and closely packed foliage plantings. Whether growing them in containers or out in the backyard, the soil should be well drained and rich in organic matter. Working compost into the soil will accomplish this. Once the soil has been thoroughly prepared, you’re ready to set the stage for your exotic jungle. Remember, the purpose is to achieve a tropical atmosphere. Within a jungle environment, emphasis is often placed on non-woody vegetation; therefore, you’ll want to focus on using a variety of foliage plants consisting of different colors, forms and textures. Plants with striking foliage will add dimension while those having dramatic blooms will provide additional interest to the exotic jungle garden. Climbing plants, such as the trumpet vine or passionflower, will enhance the garden’s tropical effect as well; however, avoid planting varieties that could eventually overtake the garden or invade the surrounding landscape. Once established, the exotic jungle garden should not require much care other than watering. There’s no need for extensive pruning or weeding. 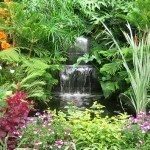 Allow your jungle garden to remain as natural looking as possible. However, applying a suitable layer of mulch will help retain moisture and keep any weeds down. It is also a good source of nutrients for your plants. Winter protection may be needed for colder climates; therefore, you may want to consider implementing containers into the outside garden for less-hardy plant varieties, such as bananas. These tropical beauties, as well as many others, have no problem adjusting to a potted environment. Containers also provide an interesting alternative to anyone lacking adequate space for growing an exotic outdoor jungle garden. By filling up a large container or even a group of numerous sized pots with various foliage plants, it’s still possible to bring a touch of the jungle to small areas such as patios or balconies. Don’t be afraid experiment; this is your jungle paradise. Design this exotic garden to fit your individual tastes and requirements.